ChromaLuxe HD Metal prints are in a class of their own. Order one with your own image from one of our print partners. Click here for a lab listing. A world of amazing imagery can be found at the Multimedia Hall – an open stage for nature. In a large, newly-designed display, the contributors are exhibiting the best pictures from their presentations: one photographic highlight after another. The list of participants is impressive and reads like a who’s who of wildlife photography: Norbert Rosing, Axel Gomille, Barbara Vetter und Vincent Heiland, Günter Nowald, Tobias Hauser, Hermann Hirsch, Martin Stock, Heidi und Hans-Jürgen Koch, Tim Flach, Josef Friedhuber, York Hovest, Benjamin Jaworskyj, Olivier Grunewald, Bernd Römmelt and Holger Fritzsche. In Zingst, photographers meet every year for the great environmental photo festival "horizonte zingst". In 2018, for the eleventh time, this festival of photography will take place in the Ostseeheilbad. The event has grown steadily over the years and is now a focal point of the photo industry. Outstanding photographic exhibitions, encounters with famous photographers and an exciting package of services are all features of the program. It is a photo festival of emotions and information. In 2018, ChromaLuxe prints will be exhibited in 3 different locations. A new solution for top quality fine art and professional printing. Great for home-decor. You have a great image. Why not have it printed on ChromaLuxe HD Metal? ChromaLuxe prints are made using a dye-sublimation process. Sublimation onto metal is a new, cutting edge way to reproduce high quality photographic images. Ideal for stunning fine art photo exhibitions. The image is printed onto transfer paper using sublimation inks. It is then positioned against the specially coated aluminium ChromaLuxe sheet and placed into a high-pressure heat press at 200°C. The inks transfer from the paper and are permanently infused into the coating. The result is a very high-quality photo print with vibrant colours and an almost 3-dimensional feel. Aluminium is available in Gloss, Semi-Gloss (Satin) and Matte surfaces. ChromaLuxe is also available on Steel, MDF and hardwood. Endangered is a powerful document of species that are on the edge of extinction. This is a 'must-see' exhibition held in the outdoor space of the Postplatz in central Zingst. Twenty four large 1.2m x 1.7m prints produced on ChromaLuxe's new EXT outdoor print material. 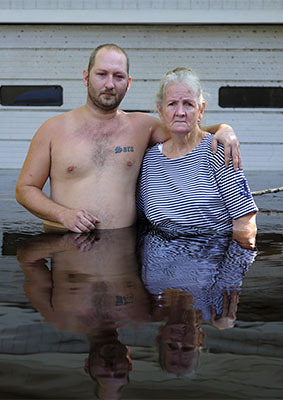 Drowning World is a visual attempt to capture the magnitude of climate change through portraits of flood survivors taken in deep floodwaters, within the remains of their homes, or in submerged landscapes, in the stillness of once lively environments. Keeping their composure, the photographed subjects pause in front of Mendel’s camera, casting an unsettling yet engaging gaze. These images, taken across the world, bear witness to a shared experience that erases geographical and cultural divides. Six large 1.2m x 1.7m prints produced on ChromaLuxe's new EXT outdoor print material.